Philadelphia is known as the city of "Brotherly Love" and "America's Birthplace", but did you also know that it's home to the world's largest outdoor art gallery? There are more than 3,800+ outdoor wall murals in Philly and that number continues to grow. The murals are collaborations between the City of Philadelphia Mural Arts Program and local citizens. You'll find thousands of beautiful murals painted on the outside walls of various buildings throughout the city. On our blog today we're featuring the COMMON THREADS wall mural located on Broad and Spring Garden Streets in Center City. The mural was designed & painted by artist Meg Saligman and was completed in 1999. The artist has done several murals nationally and internationally, and has won numerous awards for her artistic works. The mural's design depicts real, contemporary young people imitating postures of historical figures. Each pair, human and figure is painted in the same scale. You'll notice that some are women, while other's are men. The colorful design is quite large and takes up the entire side of the building. When viewing it, make sure you stand several yards away, so that you can see the entire scene at once. Plus, to get the best photo, you'll want to be at least 50 feet away. 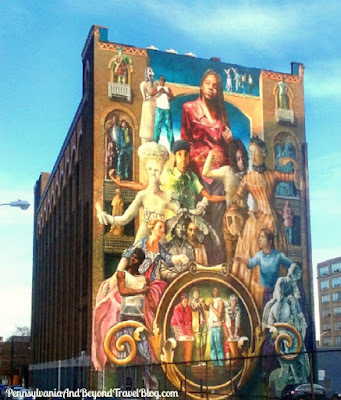 If you enjoy outdoor wall murals and urban street art, you'll definitely want to visit downtown Philadelphia. The murals which are found throughout the city are a popular tourist attraction. You can opt to do your own self-guided tour or sign-up for one of the "paid" tours that are offered by local businesses. We personally recommend the trolley tours offered by the City of Philadelphia Mural Arts Program. They're informative and fantastic!